This is an independent resource to supplement the original book, enhancing your experience of The All-Girl Filling Station's Last Reunion. As she approaches her 60th birthday, Sookie seems to have this life thing figured out. She is married with four grown children, and her biggest concern is trying to get her overbearing mother to move into a nursing home. Then one day, Sookie learns a family secret that causes her to rethink her entire existence. The one and only Fannie Flagg, beloved author of Fried Green Tomatoes at the Whistle Stop Café, Can't Wait to Get to Heaven, and I Still Dream About You, is at her hilarious and superb best in this new comic mystery novel about two women who are forced to reimagine who they are. Sookie begins a search for answers that takes her to California, the Midwest, and back in time, to the 1940s, when an irrepressible woman named Fritzi takes on the job of running her family's filling station. Soon truck drivers are changing their routes to fill up at the All-Girl Filling Station. Then, Fritzi sees an opportunity for an even more groundbreaking adventure. As Sookie learns about the adventures of the girls at the All-Girl Filling Station, she finds herself with new inspiration for her own life. 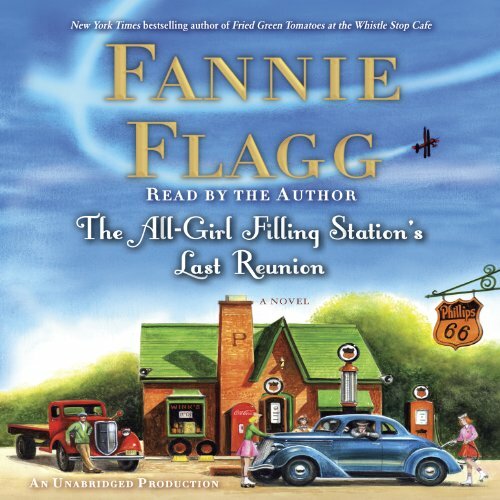 Fabulous, fun-filled, spanning decades and generations, and centered on a little-known aspect of America's 20th-century story, The All-Girl Filling Station's Last Reunion is another irresistible audiobook by the remarkable Fannie Flagg. You really end up going through a life journey with this character, who discovers herself adrift as to past, identity, purpose....and it's a romp of a journey with twists that leave you laughing, thinking 'how ever in the world!' It's inspiring as well as entertaining. I loved the narrator, story, everything but must mention, there are production problems. A couple of times the narration goes back a few chapters and replays entire sections. So don't think you are crazy when you think 'didn't I already hear this part?' you did, and you'll have to forward a few places to pick up the story again. This story is good enough you'll be happy if you don't let this dissuade you! What did you love best about The All-Girl Filling Station's Last Reunion? 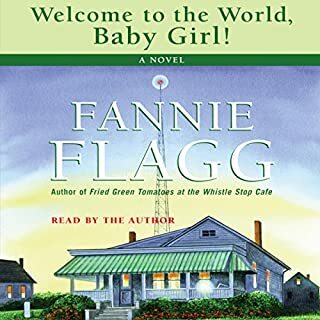 I love Fannie Flagg's approach to life, the characters she includes could well be in my own family and the neighborhood where I grew up. Besides delightful characters and situations, I loved the historical settings. What other book might you compare The All-Girl Filling Station's Last Reunion to and why? 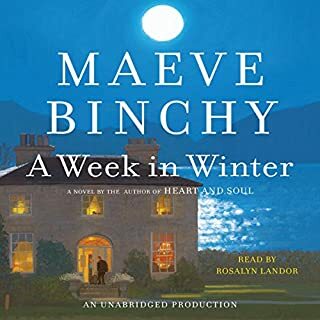 Maeve Binchy's books are similar in scope. Believable story in a realistic setting. Wonderfully diverse characters. Have you listened to any of Fannie Flagg’s other performances before? How does this one compare? I believe this is the first story I've heard which was narrated by Fannie Flagg, herself. At first, I thought the voice sounded too old for some of the characters, but I adapted quickly. 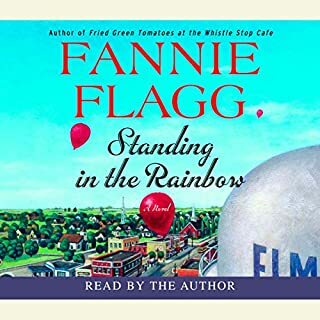 I've read or listened to everything Fannie Flagg has published. The characters and story in this title did not disappoint. The historical context is very important, as a bit of "womens' rights" during and after WW2 are a large part of the story. Many of us are unaware of the many separate battles women have faced in gaining their fair share of salary, position, etc. Of course, I was always waiting to see what would happen next. I broke out in spontaneous laughter over many situations and comments. This book left me feeling happy. I don't need any "downer" literature! And I'm absolutely sick of all the vampire and science fiction mysteries. I wish they would have their own special category so I wouldn't have to trudge thru them in a search for new titles. Wonderful! One of Flagg's best!! The Misadventures of Maude March is wonderful and has interesting historical information too. Another winner from Ms. Flagg! Would you listen to The All-Girl Filling Station's Last Reunion again? Why? 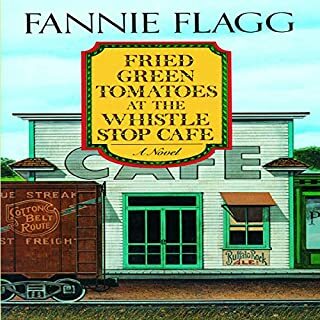 Quite similar style to Fried Green Tomatoes at the Whistlestop Café by Fannie Flagg. Both books go backward and forward thru time and have some great characters to love. What about Fannie Flagg’s performance did you like? Some of her reading was off, not enough inflection etc. but she nailed Winged Victory perfectly and even the Wisconsin characters. What if you found out your life was based on a lie and it turned out better than ever! I loved this book but the enhanced version has some repeating chapters in it, so I recommend at this time to use another version which I have been told work fine. This is my new favorite Fannie Flagg book! This had just the right amount of humor, emotion, and family drama to make it a perfect mix and a great story. Mrs. Sookie Poole has accidently found out some life altering information, that changes how she sees herself and who she thinks she is, which honestly she was already struggling with before any of this happened, since she just married off her last daughter. She has an overbearing mother who she thinks is never happy with anything Sookie does. She is lucky that she has a wonderful, understanding husband and great kids that help her through this difficult time. We also meet Fritzi in the 1940’s, her family runs a gas station but when her father takes sick and her brother is sent off to war the girls of the family take over the station and make it a big hit with an all-girl staff. This works for a while but what Fritzi really loves to do is fly, and here is where we learn some great history of the WAF’s and how these sister’s became an integral part of that, it was a great history lesson of a little known part of the stateside war effort. I loved this book and when I finished it I thought about starting over from the beginning again. 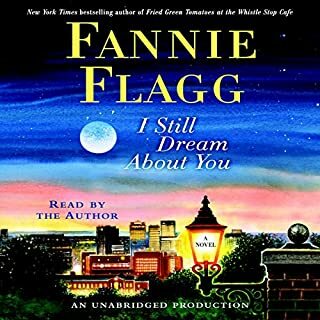 As always Fannie Flagg is one of those rare breed of authors that excels at reading their own work, try the audio you won’t be disappointed! Great Picture of the South and it's women. While it is light reading we get a look at the women of the South today and and the women who stood strong in WWII. I did think the use of the words 'gal' and 'pal' were way over done but that's a minor thing. I enjoyed Sookie and her journey to find her 'real self''. Normally I have found that an author doing their own narrating to be boring or grating on the ears but Miss Fannie was outstanding! So if you are going on vacation this is a great one to take with you. Charming and heartwarming, this was an enjoyable, light listen. The only slightly negative for me was the narration. 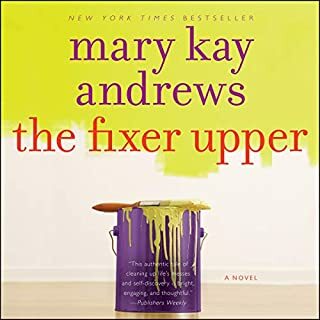 I thought she performed the dialogue very well, but the narrative portions sometimes sounded stiff and like she was reading (I know, she's the author; she wouldn't be reading...). In any case, just a nit-picky distraction. Overall, I did enjoy the historical information and the personal discovery journey of the main character. I've read almost all of Fannie's books and this one didn't fall short! I loved the story line, the characters and her ability to make you feel like you were a part of the story. I almost felt like I was listening to my life story, Lenore was my mother.. and almost all mom's of the deep south. Fannie is an amazing story teller and her performance really made the book even better. I'm so glad that I decided to listen to it instead of reading it. Such a wonderful feel-good, vacation book. Read it, you won't be disappointed! !